A thick, heavy fog covered my entire room when I put this on my stereo to take a small taste of my favorite English doom ‘blend’. Before my introduction into the CROWNED IN EARTH world, I thought that the sceptre had their mighty compatriots THE LAMP OF THOTH; but no, I was wrong. These two bands might have a lot of differences if we talk about techniques and guitars’ style, the creating atmosphere of their music though keeps the high standards of the traditional English doom Metal that we all love and trust. Low-tuned guitars with lots of ‘70s characteristics, heavy and catchy riffage and a trembly, hair-rising voice that makes your fears bigger and bigger are all those components that raise our horns up and fill our souls with this unstoppable thirst for doom- so, CROWNED IN EARTH could not be an exemption from this Holy rule. At just over 35 minutes, this debut album is a modest straightforward effort in the style of classic ‘70s English doom Metal with a small dose of Italian Horror church organs. The album’s title, “Visions Of The Haunted” could be characterized prelusive, making us clear the gnarled path we are about to walk on. The opening “The Sun Never Stays” carries all that groovy riffage on it reminding the up-tempo (!) passages of REVEREND BIZARRE, CATHEDRAL and of course, BLACK SABBATH, when the next “The Voice That Controls” raises up the flag of the Italian horror prog doom like Paul Chain, BLACK HOLE, ABYSMAL GRIEF or DEATH SS used to, in the past. Kevin Lawry’s vocals are solid and heavy as hell, giving all the strength and the massiveness to CROWNED IN EARTH’s sound and Darin McCloskey (maybe you remember this name from PALE DIVINE, yeap, that’s the guy!) stands in deservedly with his monolithic drum-catapult. Nevertheless, my favorite track from the album is the closing “Awaken” and that’s because of its heavy creeping atmosphere, reminding me in a way an abandoned graveyard somewhere in England or an underground ‘60s Hammer Film production. Also, “Awaken” has something form the SOLITUDE AETURNUS eastern mystery that I could not explain it better without this sentence. Notice the extremely well production in the album’s entity and try to count more than five debut albums you have listened to, with the same acoustic result. It is superfluous to say how good “Visions Of The Haunted” is or how many brilliant compositions contains; it’s a very solid doom debut album though from an act to keep a watch out for and that’s for sure! 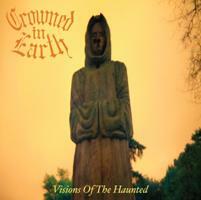 If you’re a fan of traditional doom Metal and you’d like to hunt some undiscovered gloomy doom diamonds, then this one is highly recommended- till the next CROWNED IN EARTH release, I guess.